Thank you Hardknott that was the toughest days riding ever, but I’m so glad that I did it. Over the past twelve months we’ve talked about a variety of cycle ‘challenges’, but being relatively time-poor, my preference is always to really up the anti… to get maximum bangs from my ‘time away’ bucks. 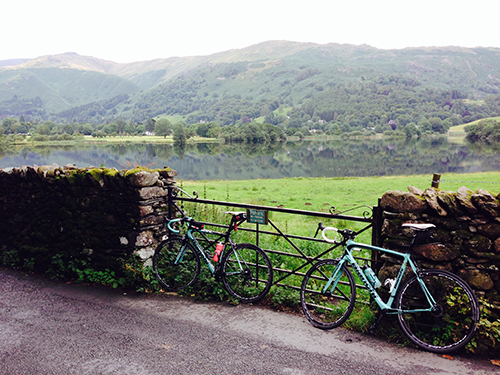 So when Ian sewed the seed of a Lake District visit to do Hardknott (having read the profile in June 2015 edition of Cyclist magazine), a plan started to come together and a weekend was booked for the 22nd&23rd September. Living on the side of the Severn escarpment, we have some challenging hills nearby that we could train on and test our climbing ability, but we knew that the Lakes were going to be on a different scale altogether, which proved to be the case exactly. Everyone in the UK this summer will know that August was horribly wet and the Lake District gets those large expanses of water by picking up more than its fair share of any wet weather, so it came as no surprise to find the window wipers on for the entire drive up the M5 and M6. 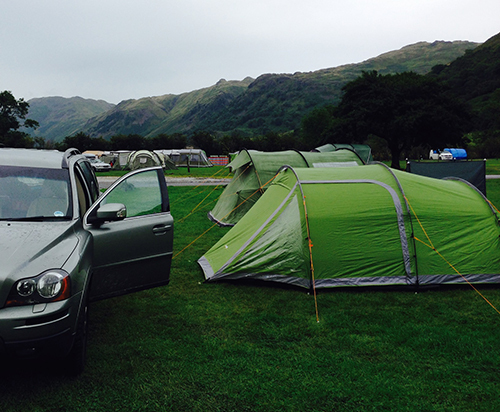 We arrived at the Brotherswater campsite in light drizzle and, faced with a field struggling to cope with the amount of standing water, decided to bag a drier pitch before heading into Ambleside while the weather subsided. That proved to be a genius decision as the arrivals later on Saturday afternoon & evening were struggling to find areas dry enough to take any sort of tent. An hour in Ambleside to stretch our legs after the drive proved invaluable – the weather started to clear, a quick mooch around some of the camping shops was pleasant, a swift Lakeland pint at a pub on the High Street was perfect and the advice from the chaps at Bike Treks was invaluable, although they were just the first of several people who told us that Hardknott was going to be hard. We’d decided that spending the afternoon in one or other pubs probably wasn’t the right thing to do and we were keen to get a few Lakeland miles under our belts before the Hardknott ride the following day, and the pointers from Bike Treks on a 90 minute circuit was invaluable as the weather cleared and we unloaded the bikes. There’s something quite special about riding into the mountains, with its clean air, gushing streams, covered glades followed by open meadows, all a step up from the countryside that we have down south. Ambleside was obviously busy with tourists, but once we’d left the main roads we didn’t really see many cars at all, which made for magical cycling. 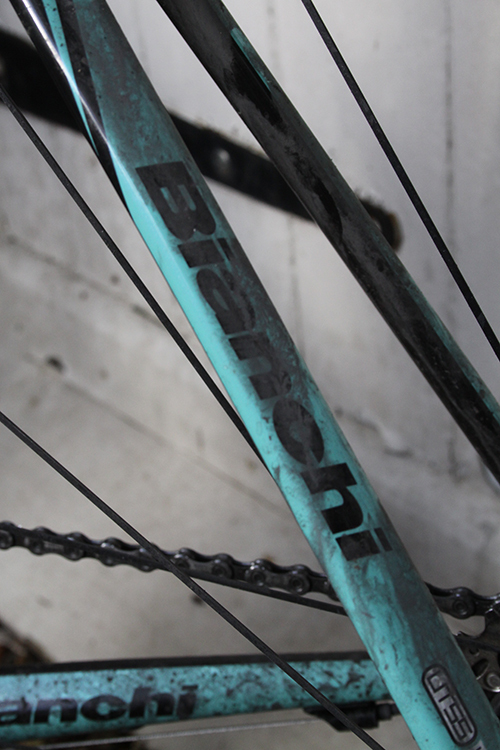 It’s worth noting at this point that we were both running the Bianchis with their stock Ultegra 6800 compact set-ups. I had picked up a couple of 32-tooth cassettes for the cyclocross bikes, but these had proved too much of a stretch for the short cage rear derailleurs in some ratios, so the Saturday ride was a test to see whether our gearing was going to work in the mountains… and to be fair there were no alarm bells ringing on Saturday’s spin, so we stuck with the standard set-up. As we came back to the car after our short spin, it had started to spit with rain and by the time the bikes where back in the boot of the Volvo it was bucketing down. This proved to be the sound of the next twelve hours and we sat on the veranda of the Brotherswater Inn tucking into a steak pie evening meal with absolutely torrential rain hoofing it down around us. Walking back to the tent in the dark proved interesting as the light from the headtorches bounced off of the standing water that had built up between the tents. By Sunday morning the world had changed and we got ourselves ready in warm sunshine, but it was clear that there was a lot of wind battering the hills around us. The Hardknott route in Cyclist started and finished in Ambleside, however we’d be starting from near the bottom of the Kirstone Pass and would have to get over that before a swoop down The Struggle, that we’d have to come back up at the end of the day, into Ambleside and breakfast. One thing worth flagging at this point, I don’t normally ride with ‘day’ lights, but I’m rethinking this approach at the moment and decided to pop some flashing ‘visibility’ lights on both bikes – this proved to be an invaluable decision later in the day. As mentioned, ‘proper’ breakfast was planned for Ambleside, so our kickstart for the day was a quick cuppa and an Eccles cake brought from home. I normally like to get a few miles under belt, including a good leg spin, before I’m ready to tackle a good ride, but from our tent everything headed straight up onto the Kirkstone Pass, so no chance of a leg-warmer and what a grind that proved to be. I’m very glad to say that this first experience of Lakeland mountain passes wasn’t too painful, although we received a battering from a headwind and the only solace there was the knowledge that it would give us a good lift at points during the day. It’s always satisfying to start an early morning summer ride in short-sleeves and arriving at the Kirstone In at the top of the pass in glorious sunshine put us in great spirits, as we turned off down The Struggle towards Ambleside – that descent was an eye-opener, while the Kirkstone Pass had been a long grind, it was clear that the gradients on The Struggle were in a different league, and you get a totally different perspective when you’re on a bike compared to being in a car. Crossing the road in Ambleside, a broad Scouse accent called out ”Eh! 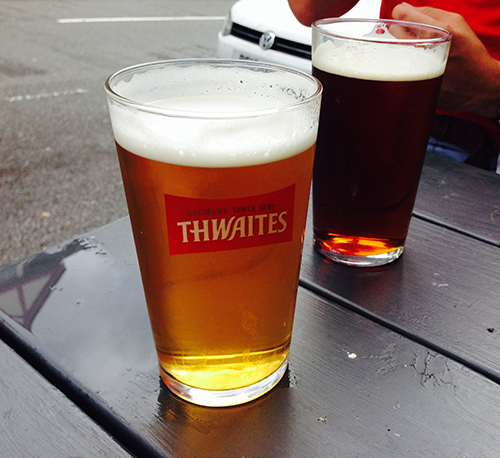 I’ve got one of them Sempre’s”, which led into a discussion about his experiences of Hardknott. As with the chaps in Bike Treks there was no disguising the fact that another person knew that this was going to be a hard day’s riding. 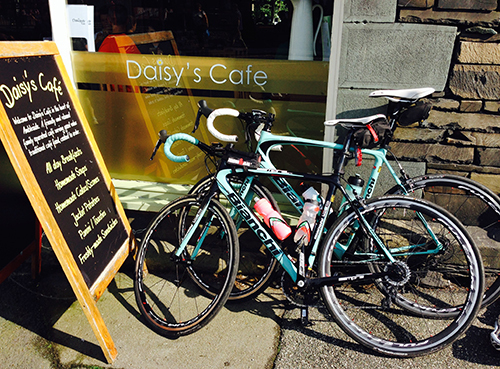 Breakfast was a result and we thoroughly recommend Daisy’s Café opposite the war memorial at the top of the high street (about 100 yards from Bike Treks). I know a huge greasy fry-up isn’t the right thing at the start of a big ride, but their ‘standard’ breakfast was exactly the right balance of well-cooked bacon and eggs, with beans, hash brown and toast, not too mention some perfectly cooked black pudding (which in my opinion is one of the foods of gods) and strong coffee. Nutrition was a concern, never have embarked on a ride that was going to be quite as strenuous, so we were working on the basis of little and often. From Ambleside we rolled out of town heading south, turning off at Clappersgate and heading for Hawkshead before dropping down the east side of Coniston. 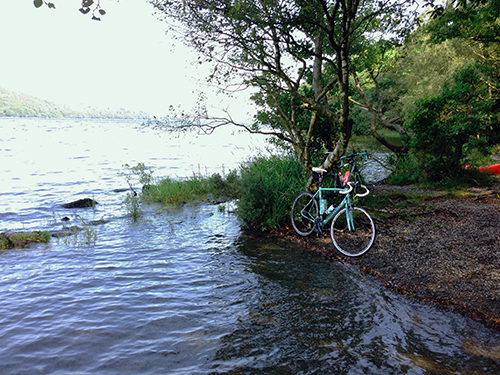 The Coniston road was beautiful rolling ride through established forest with the occasional dip right down to the water. We rolled round the bottom of the lake at Waters Yeat and back up the west side of the lake on a much busier main road to Torver. Just after Torver the road threw up an unexpected climb as the road (Hummer Lane) forked right towards Broughton Mills (and our planned lunch stop) by heading upwards at a surprisingly steep gradient. It was on this climb that I realised that I’d omitted to lube my bike at the start of the day and it started to make some ominous noises. After the shock of Hummer Lane, we enjoyed an extended roll downhill all the way to Broughton Mills and the Blacksmiths Arms. We’d probably overcooked things a bit by the time we reached the pub and I wasn’t really tempted by one of their spectacular sandwiches (really thick doorstep bread and tasty fillings), but a bowl of crispy chips and a plate of onion rings hit the spot, as did two large soda and limes. Two things stand out about our lunch stop aside from the food – one, the chap who’d cycled the Hardknott regularly as part of his Etape training and just said “Good luck” every time we mentioned the ‘H’ word – and secondly, the chef who kindly supplied a small pot of warm used chip oil to lube my chain, which may have been a last resort, but which worked kept me squeak-free for the remainder of the day. Refreshed and rested from Broughton Mills, we then started the run into Hardknott with a climb up and over Birker Fell towards Seathwaite. Around the whole circuit we experienced every single type of Lakeland scenery and Birker Fell ‘were proper bleak’, a vast open fell that left us feeling very exposed. Fortunately the wind was blowing in the right direction and the sun was still out, so it felt good to reach the top and sweep down the other side. Everything was going really well at this stage, but as we headed into Eskdale we both sensed a degree of unease at the challenges that were about to be unleashed and decided that a coffee & cake stop was probably a good idea, to calm our nerves and boost our calories. I should say that our fuel intake was working well, on top of breakfast and lunch, we’d kept the water topped up and had munched a Torq bar each and a gel (coming over Birker Fell), plus worked into a steady supply of dates. This was all working well and neither of us was feeling the effects of low energy. Whatever anyone says, there’s an aura about Hardknott that strikes at the heart, so the flat run into its base from Eskdale was nerve-wracking. From my perspective it was a case of running with the demons and accepting that the road over Hardknott and Wrynose was the only way home from Eskdale, so it was going to happen whether we liked it or not. There was also the expectation that said we’d be able to say afterwards that we’d actually done Hardknott. There is no run-in to the Hardknott climb… you roll along the flat until you reach a telephone box and a cattlegrid, and then the road heads straight up. It’s like someone’s actually taken a map of the area and put a crease in the road – there is no middle ground here, it’s flat or up, and we knew that this was where the days’ real work began!! Nothing can prepare someone who’s not ridden this type of territory before to the steepness of a hill like Hardknott and I quickly realised that we were undergeared, and appreciated why Ribble offer a 32-tooth cassette on their bike builds.Neither of us was going to be beaten though, so we battled on. The killer, not on the first corners where the camber combined to make things steeper, but on an area of road suffering from some subsidence making the surface harder to weave across – yep, I was using every trick in the book to keep moving, unlike the chap on the Cervelo who bowled past at a brisk pace. Suffice to say I didn’t keep moving all the way to the top and a couple of early ‘breathers’ on the lower part of the hill turned into some (short) stretches of Shank’s Pony towards the top. As with everywhere else on the ride, everyone was incredibly pleasant and we might have considered a lift to the top from one car driver if she’d been heading up rather than down the hill. The sight from the top of Hardknott was breathtaking, but it was clear that we’d lost the sunshine for good and that the weather was deteriorating quickly, so we couldn’t hang around. 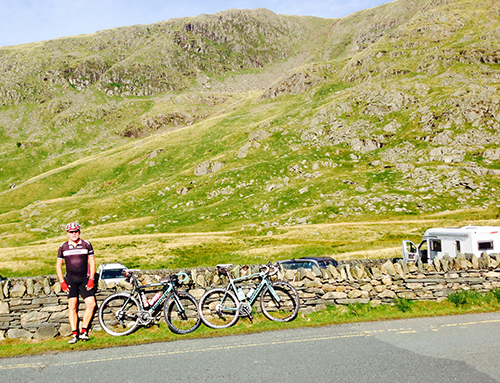 If the ride down The Struggle had appeared steep, the drop down Hardknott was a step up again. It was impossible to let the bikes roll as the hill was so steep that trying to lose velocity with any degree of speed meant either locking the rear wheel or oversteering off the outside of a bend – I’m sure that there are better skills for descending, apart from just hoping that there’s nothing coming round the corner, but we didn’t find it. We tanked across the valley between the bottom of Hardknott and Wrynose to try and out-run the rain, but the drizzle caught us up and we had to don jackets before we started the climb. I’dlike to say that Wrynose was easier than Hardknott, but the previous hill had taken its toll and there was a combination of some breathers and a revisit of Shank’s Pony. At the top of Wrynose we both breathed a sigh of relief, we’d done what we came to do… Overall we gave Hardknott and Wrynose a damn good showing, given that it was our first time up it. Now all we had to do was get back home to the campsite. By now the rain had started to fall more steadily and the warm road was beginning to hold the water, so a warning from a hiker to “get down the hill before roads got too greasy” was well heeded. The combination of those greasy roads, the descent from Wrynose probably being the worst of the day and a couple of less agreeable car drivers (who decided that their right to drive at a descending cyclist was perfectly acceptable) made for a tense few minutes, but the road eventually levelled out and we rolled in Langdale as the heavens opened. Our original plan from Langdale was to keep to the back roads and avoid the traffic, but we were going to start losing the light within an hour and were both very wet & starting to feel the cold, so we opted to blast the return to Ambleside along the main road. It was good decision, only really made possible by that earlier decision to put lights on the bikes, as the rain just got heavier and heavier, and eventually it felt as though we were riding through rivers – it’s not a place that I would want a Bianchi thoroughbred to spend any time at all, but they performed faultlessly and got us back to Ambleside in one piece. Ambleside in the rain, after 90km of the hardest riding I’d ever done, with The Struggle ahead of us, was a thoroughly depressing place as we huddled in the Bike Treks doorway to try and get some text messages home before we headed back out of mobile coverage. I’d like to say that the next half hour or so was memorable or that I enjoyed beating The Struggle, but it wasn’t, it was horrible and the only thing to write home about was that we got to the top. The temptation to tank off down the hill was huge, but I know from my cyclocross experiences that things go wrong when you’re knackered, so with a word of warning to take it easy down Kirkstone Pass we rolled off the top and headed back to the campsite. From the top of Kirkstone, to getting to the car and loading the bikes, to trudging through the rain to the showers, I don’t think we said a word, it’s fair to say that we were well and truly tired out. But as the warmth came back, so did the memories of what we’d done, Chapeau!! At the start of the day, the plan had been to try and find some spicier food for the evening meal, but the reality meant having to drive back into Ambleside which neither of us could face, so it was back to the Brotherswater Inn for fish and chips. Equally finishing the day with a decent bottle of wine and extended banter into the night had been on the cards, but by the time we’d finished the chips and slowly worked through just one pint of the Lakes best bitter, our bodies were crying out for their sleeping bags. 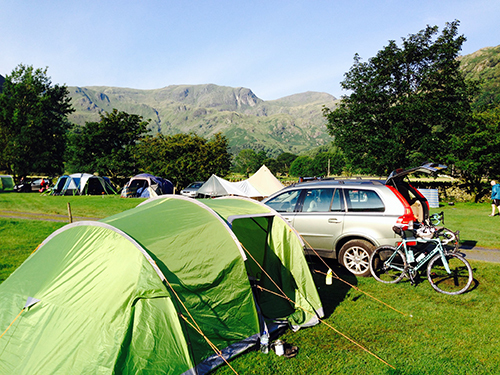 We actually did it… we bloody did Hardknott!! Previous PostUpgrading the CAADX – Tubeless disc brake road wheels?